Installation services with Wild Abandon Design is a veritable Pandora's box of possibility! From small to large scale projects, we love making your very own statement piece for your home or commercial space. The sky is the limit on what we can create - if you can dream it, we can make it. Visit our services page ( here ) for more details! 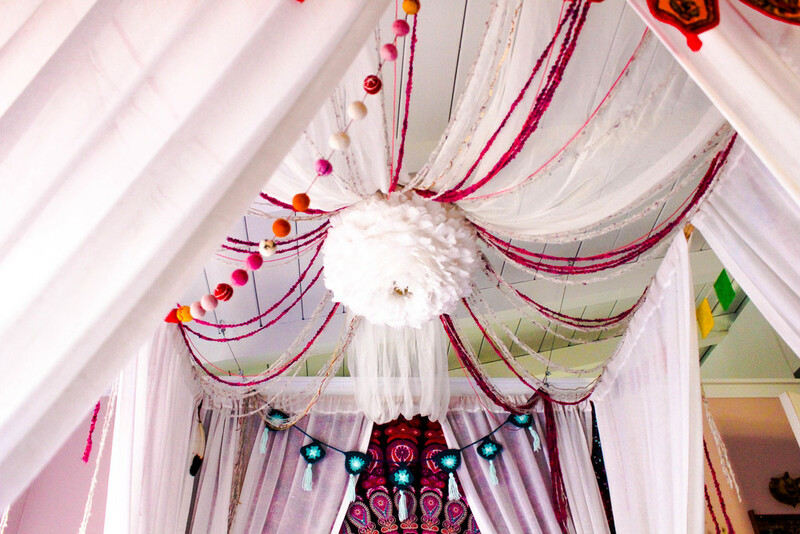 When someone asks you to create a colorful, texture-filled floating canopy over their bed, you say yes! This was such a fun project for an amazing client. Last year she bought a sculpture of Elsbeth's (see it here and at the end of the slide show) that she personally installed. Elsbeth was thrilled to get back into Kelly's space to create a personalized installation for her bed. Kelly was advised by a Feng Shui specialist to create a canopy over her bed. Kelly was open to all kinds of possibilities as she decided to move forward on this recommendation. Elsbeth wanted to use her feather lamp as centerpiece and to incorporate Kelly's youthful and joyous personality into the general aesthetic of the project. Upon request, Kelly gathered a few wonderful items she already owned to incorporate into the piece. See for yourself how great it turned out! Thanks Kelly! Enjoy & sweet dreams! This sounds cliche' but, Elsbeth says this installation literally came to her in a dream. She dreamed of a beehive heavy with honey, tucked into dramatic branches, being swarmed by brightly colored, hovering birds. The birds were not attacking the hive but rather making the hive, like they were the bees and this was their life's work, their home. She wanted to create the dream scenario. After being approached a few months later to collaborate on an editorial photo shoot with a powerhouse of a team, she knew this was her opportunity to create the hive. She worked with an incredibly talented taxidermist who ethically sources her birds, to design the birds in specific flight positions. 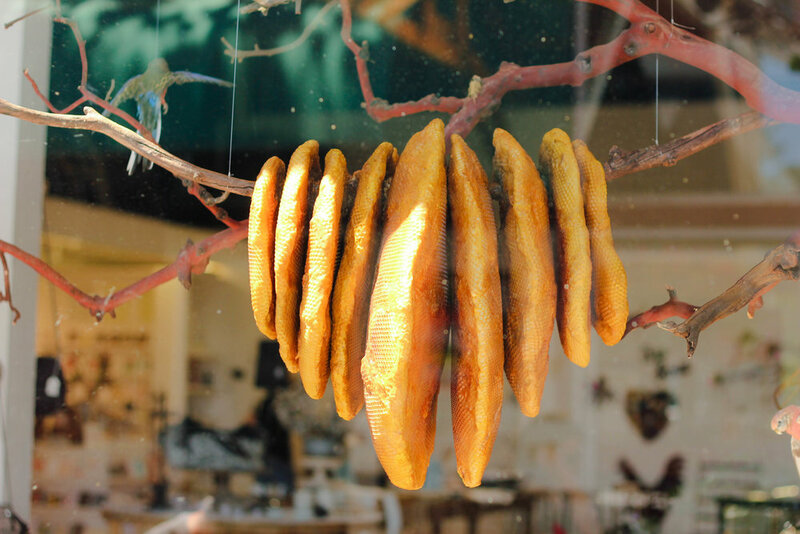 The hive is made from real bees wax, hanging from a madrone tree branch. The editorial is still under wraps, but will be on the blog as soon as it is released. In the meantime, "The Birds & The Bees" are on display in the front window of the beautiful Santa Cruz shop Hive & Hum. There's something evocative about this installation, something real and powerful, something romantic and haunting.